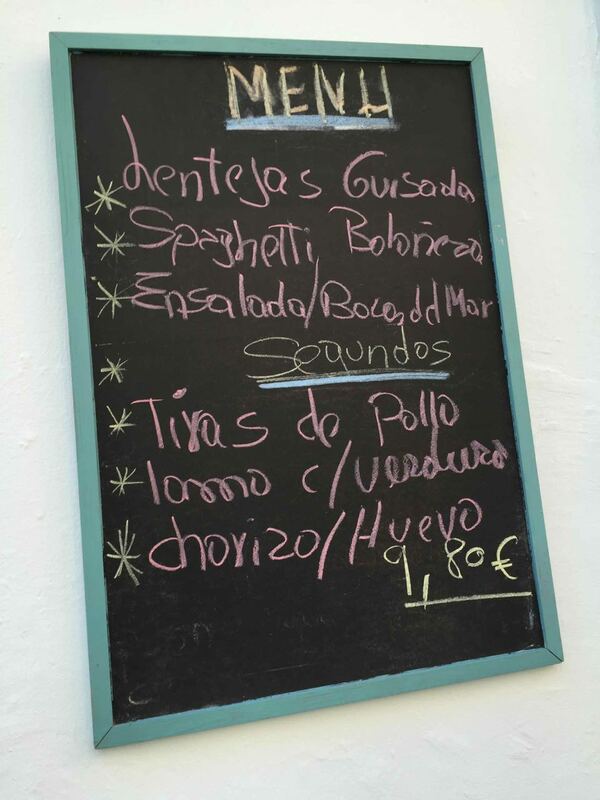 Traditionally, the menu del dia was for workers who couldn’t make it back home in time for lunch. Curiously, Franco is credited with its creation. 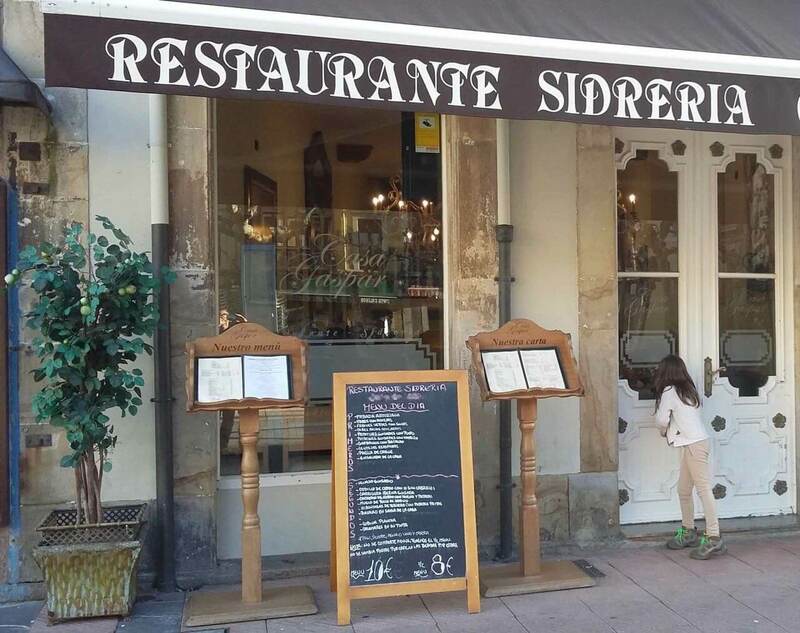 He had designed a set-price tourist menu back in 1964 and replaced it with the ‘menu del dia’ in 1970 to showcase Spanish regional cuisine. Today, it still fits that original purpose – a nourishing and complete three-course meal that offers good value for money. 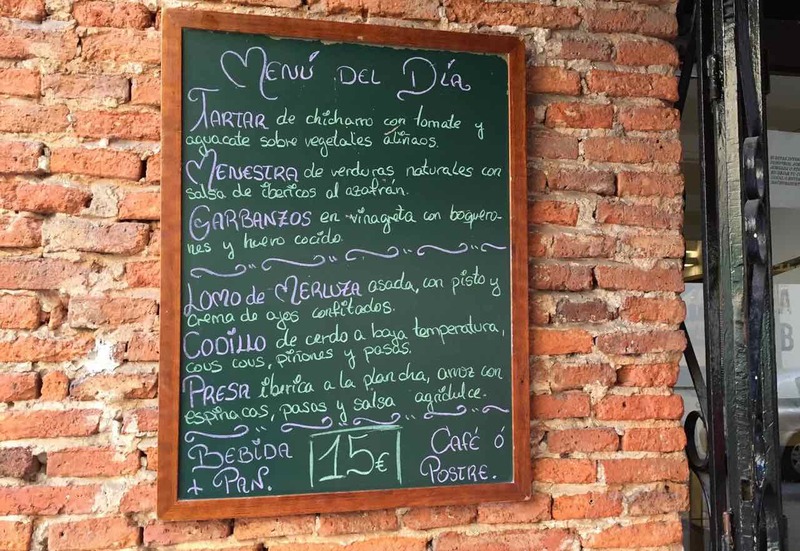 Even if you don’t see the set-price menu board outside a restaurant, it’s always worth asking staff whether they offer a menu del dia. 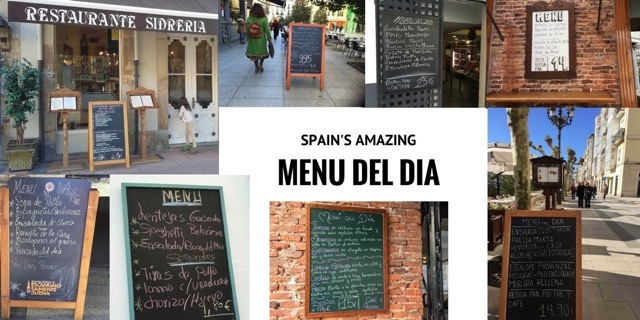 All of the images today come from menu boards in Northern Spain – where you’ll find amazing value for money when it comes to quality casual dining. 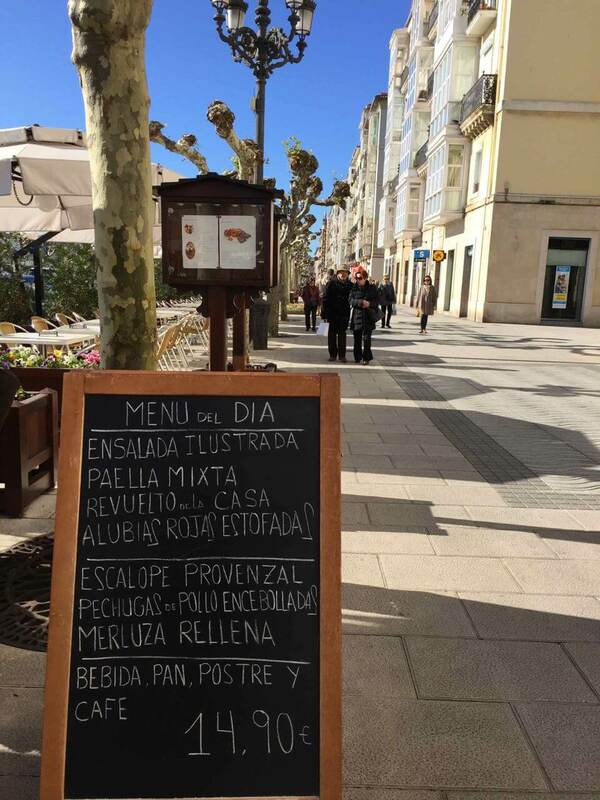 You’ll come across these chalk boards in every town and village, city and even some airports and train stations offer them. 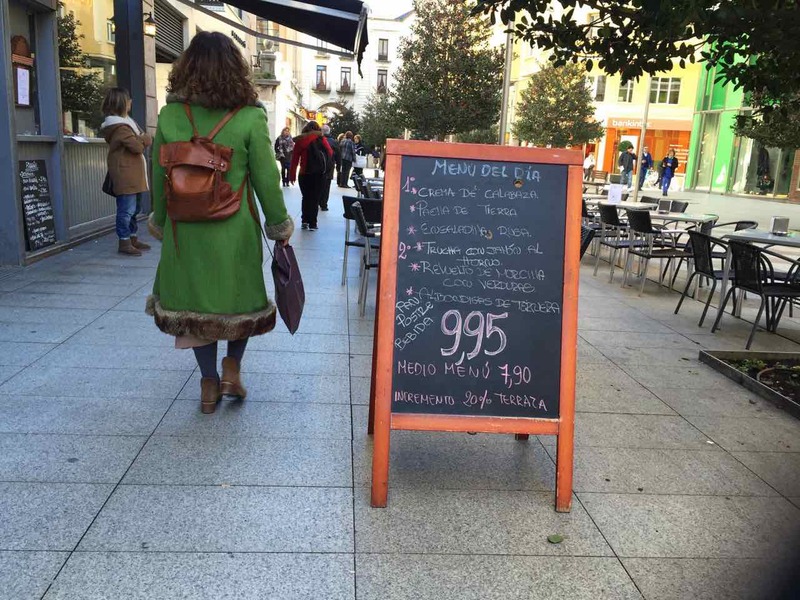 The average price for the chalkboards you see here today is 11 euro but we were on the busy main streets. 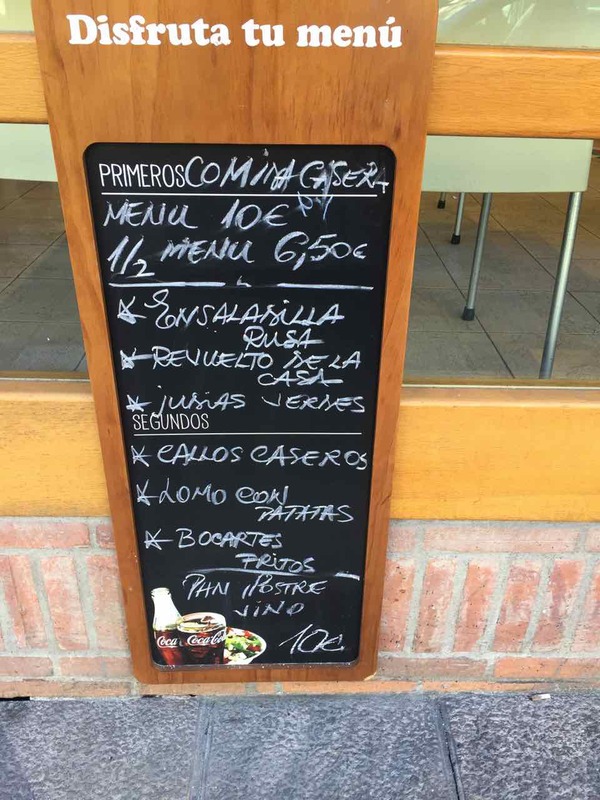 If you are prepared to walk a little bit more from the centre of the city or town, you’ll find dozens of boards offering the menu del dia in Spain for under 10 euro! 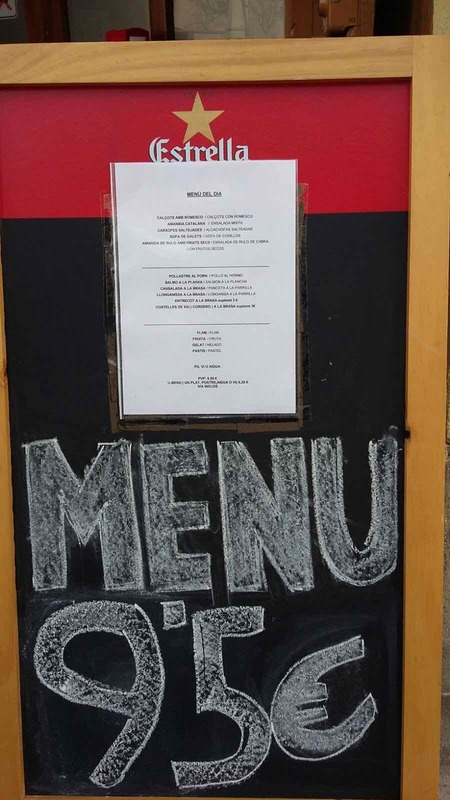 Some of the chalk boards might look a bit rushed – and that’s a good sign – it has been written hastily by the chef after he or she has returned from the food market. This is why you rarely find translations of the menu in English. 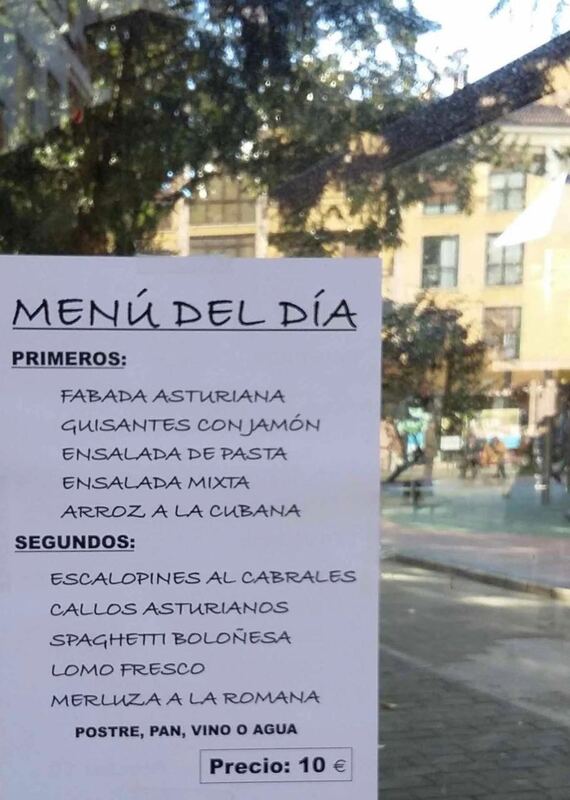 In fact, if you see anything that indicates that the actual menu wasn’t prepared that morning (laminated menus, translations or photos of what’s on the ‘menu’ that don’t look like they were done that morning) then avoid the place! One of the reasons we love eating the ‘menu’ is because it is always local and seasonal. The chefs buy and serve what’s on offer at the market – which is what is in season. They also serve what the clients want to eat – which is warming and comforting stews in winter – with more grilled dishes in the Summer. If you are eating on your own or with just one other person, you may have to decide between the red wine or the water or ask for both and be charged for the water. If there are four or you or more, you can just say ‘agua y vino’ and they’ll bring both to the table. In the larger cities, restaurants are starting to serve glasses of wine rather than bottles so don’t be insulted if it happens to you – just rejoice when it doesn’t. 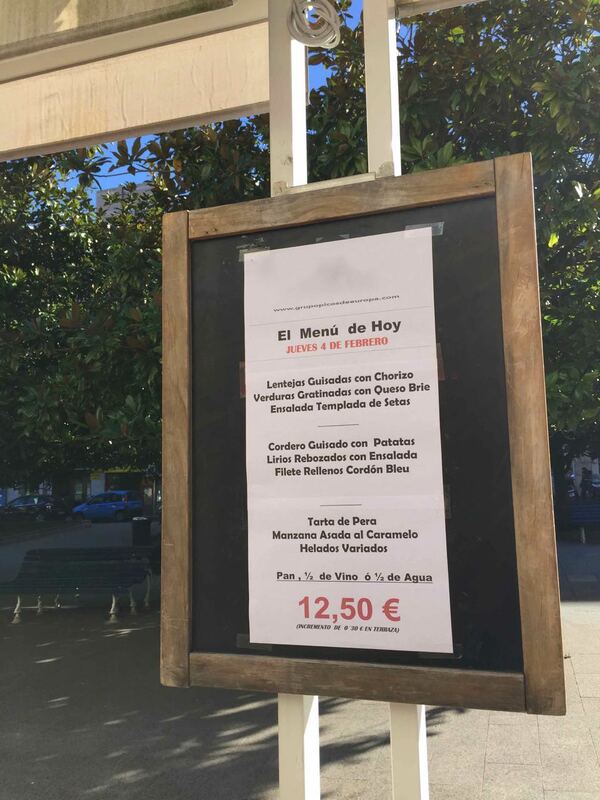 It’s unusual to have white wine with a set-price menu in Spain– but if that’s what you want, you’ll probably be brought a glass. If you don’t want wine and prefer a draught beer, ask for a cana. In the more rustic of places, when you order wine, you might be offered ‘Casera’ which is a fizzy soda water and is great for lifting what might be a fairly cheeky or young red wine. If you see others with a bottle of Casera on the table – you know what you are being given. Try it – it’s not bad. You will always be served a basket of bread or a breadroll with or just before the first course appears. You may or may not be offered more bread if you finish the first batch. If you want more – ask for it. Butter is never served – although if you specifically ask for it, it will be brought, with a raised eye-brow or two. You might find olive oil on the table and you can use that if you don’t like dry bread but we recommend you wait and dip the sauces from your plate. When in Spain! The first course isn’t an appetizer or starter – it’s actually your main course. So if you are hungry, this is where you need to pack in the carbs and the volume. Pulses are your friend if you are starving for two reasons – firstly because they are filling and secondly before they are often served in a big casserole pot from which you serve yourself – so you can have seconds and thirds – if you need to. Pastas and rice dishes also crop up here a lot. For those of you looking to shed pounds rather than gain them – look out for the soups and the salads. The second course is where you get your protein. You’ll find a meat, fish and perhaps an egg-based dish here. The pricier the menu – the better the cuts of meat or varieties of fish. But cheaper cuts don’t mean bad quality – the opposite in fact. we love slow-cooked beef cheeks, the homemade meatballs in a rich sauce and the stuffed peppers – these are the dishes you rarely prepare at home. Sometimes these are served or garnished with a few fried potatoes or side-salad but you’ll find plenty of places that just serve it as it is. This is how the Spanish eat. Desserts tend to be egg-based in Spain. The king of all menu del dia desserts is the ‘flan’ which is a crème-caramel often served with cream. Rice pudding is another one that crops up a lot. And natillas which is a custard. You might also be offered ice-cream which is probably not home-made. It’s often a Magnum or Cornetto. Fresh fruit is another popular offering. And yoghurt is another. Even if you aren’t offered fruit – you can ask whether they have any. We love when strawberries are in full season around Easter time and the restaurants prepare them with cream, orange juice or our old favourite balsamic vinegar. You can order a coffee afterwards and it will be added to the bill as an extra. If you haven’t ordered dessert, you generally won’t be charged for the coffee (it replaces the dessert). When having your coffee, you might be offered a free digestif if you look like you’re not in a rush. ‘Chupito’ is the word for an after dinner snifter. Go with whatever is on offer. It’ll come in a shot glass and might be herbal, honey-infused or something sweet like a hazelnut, coffee or Bailey-like cream liqueur. Sometimes the waiter will bring out the bill when you’ve ordered your coffee. If not just ask for “la cuenta cuando puedas”. The bill should be the exact price of the menu plus whatever coffees and other extra drinks you’ve ordered. You may be charged a terrace supplement – but this should have been pointed out to you already. Very occasionally you will have taxes added onto the price – although this is both illegal and annoying. Prices advertised to the public should always state VAT (known as IVA). 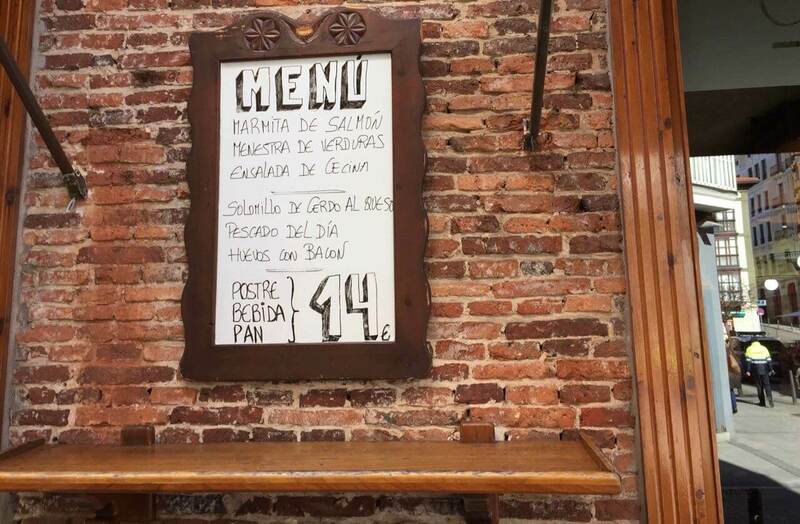 Pro-tip: Although it’s never expected in Spain, we would leave a tip of 1 euro per person if you enjoyed your meal. If you adored it, we would leave 2 euro per person – but that’s definitely not expected. 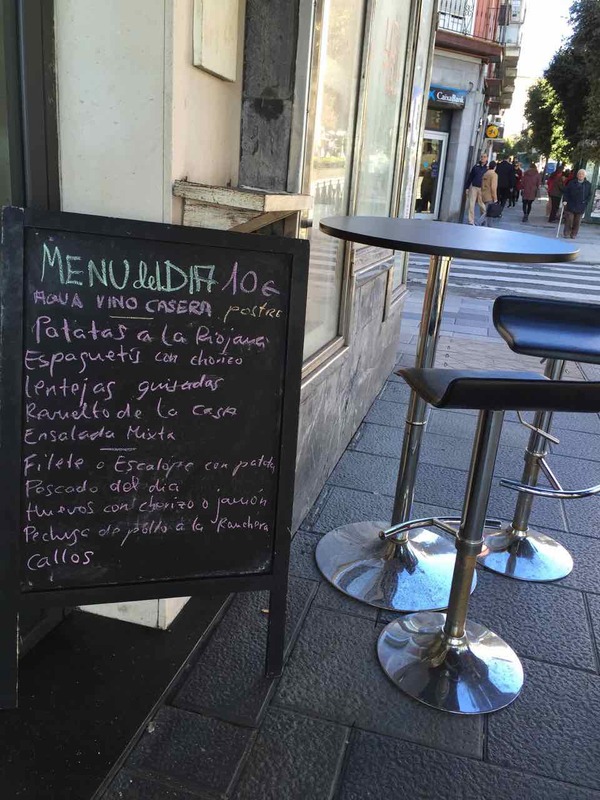 Read more about tipping in Spain here. 14 Alternatives to the Men del Dia in Spain? Some restaurants are aware that the two-hour lunchbreak doesn’t suit everybody. If you see the ½ menu, it usually refers to having a starter and a dessert for a little over half the price of a three course. 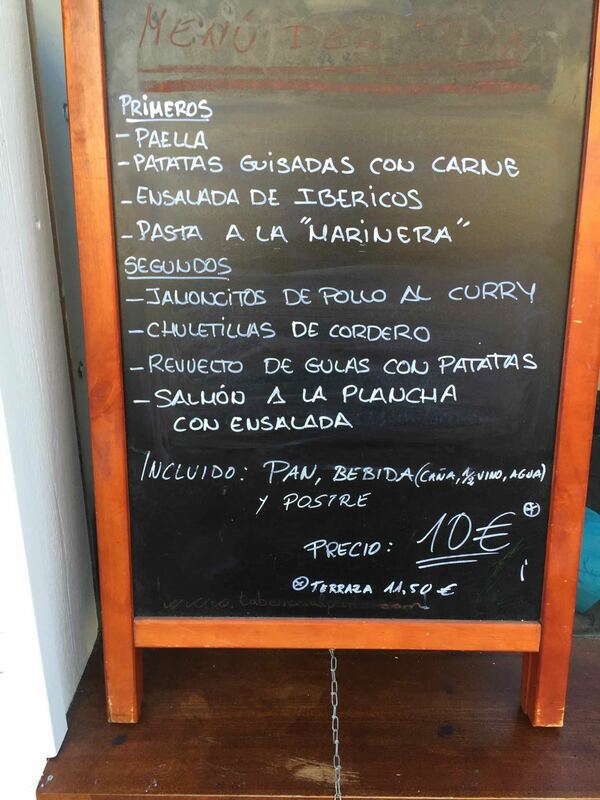 Other premises offer a ‘plato del dia’ which might cost about 5 euro and you pay your drinks, bread etc as extra. There is always the plato combinado option which is usually a grilled steak with chips with a side salad or eggs with chips and chorizo. 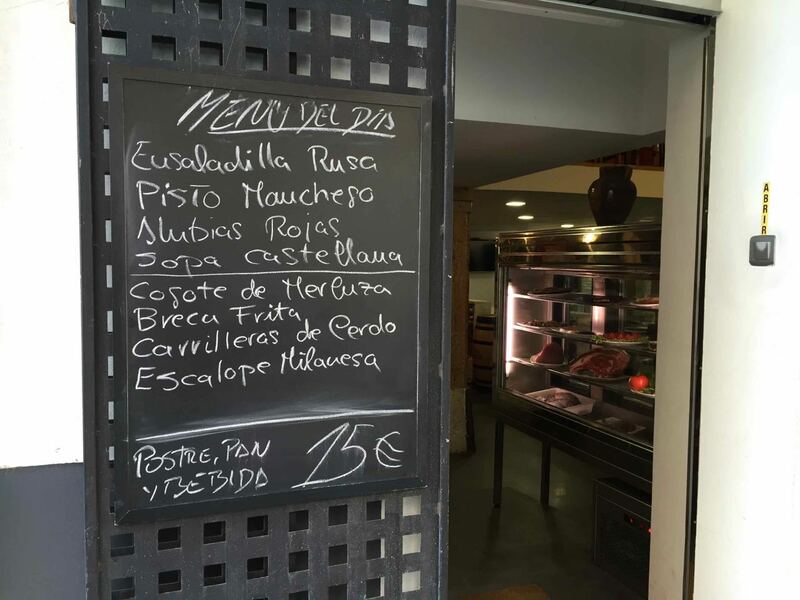 And of course – everywhere will have the ‘a la carte’ menu as well. 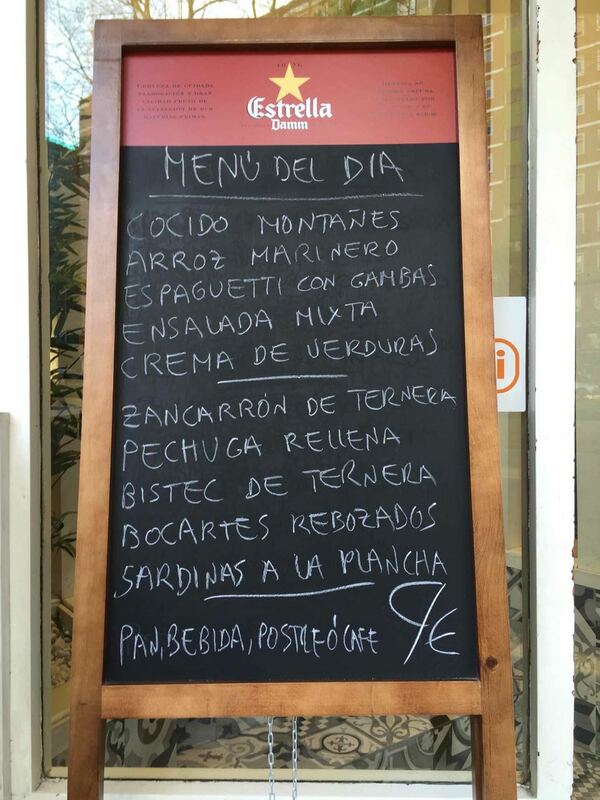 Plus the degustacion or tasting menu – although this is usually at weekends and evenings. 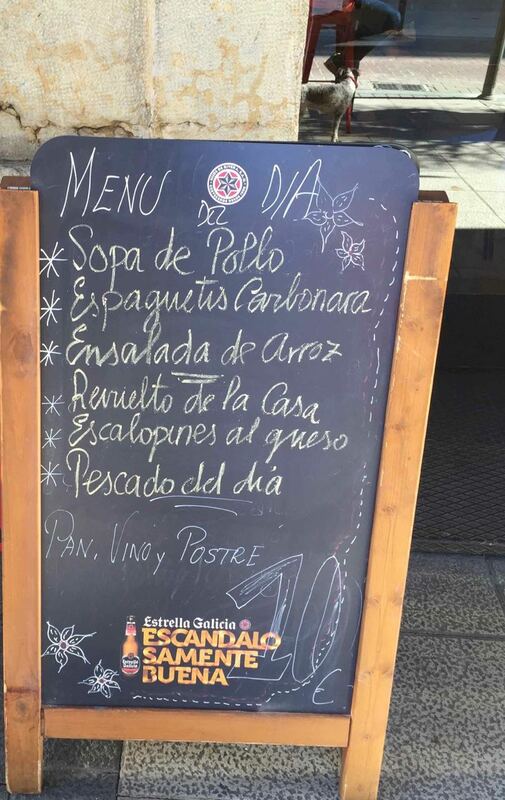 So that’s the basics about the menu del dia in Spain. Want to read more about Spain’s food & drink? Check out our other posts about Spanish Food & Drink! 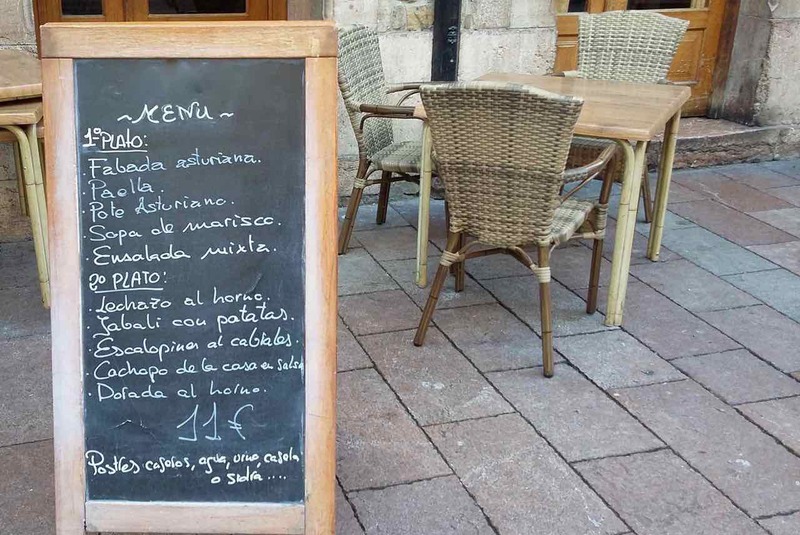 Posted in Cantabria, Food & Drink, Popular Posts, Santander, Useful Information and tagged a la carte, bars, bread, casera, chalkboards, dessert, dinner, fixed-price, foodie, IVA, lunch, mains, meals, menus, pudding, restaurants, set-price, Spain, specials, starter, sweet, three-course, value, water, wine.